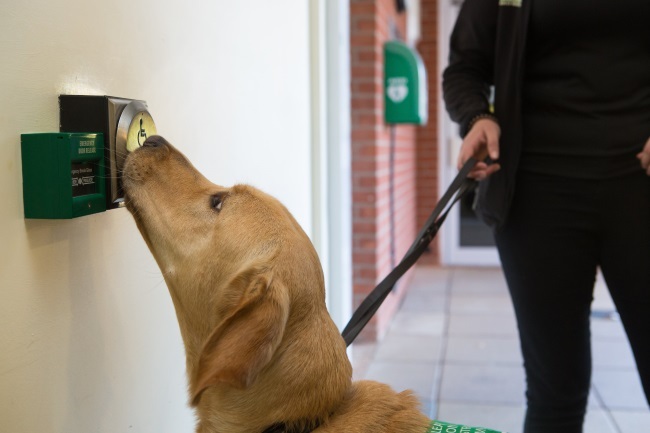 Since 2013, Dogs for Good has been in collaboration with The Open University on a research program using smart technology to help assistance dogs. Run by the OUs Animal-Computer Interaction (ACI) Laboratory, the ‘Technology for Dogs with Important Jobs’ research programme addresses real-life challenges faced by working dogs who perform important tasks on behalf of humans. Many working dogs operate in environments or with methods that are inconsistent with their evolutionary characteristics. The ACI Laboratory has produced methods and canine-centred prototype technologies to help. Part of the research programme is the ‘Dog-Smart Homes’ project which is where Dogs for Good has been instrumental. The project has looked at how, by making simple changes to design of many everyday items, we can make it easier for assistance dogs to do their important tasks and assist people’s independence. The ACI Lab has developed a range of wireless canine-centred controls, translating and applying well-established interaction design principles consistent with the sensory, cognitive and physical characteristics of dogs. The controls are designed to be easily retrofitted in domestic and public environments to make these more accessible to mobility assistance dogs and their assisted humans. The Dog-Smart Homes project has recently been showcased at the Edinburgh Science Festival where The OU team and Dogs for Good staff and dogs demonstrated the latest part of the research. View What does it take to train an autism assistance dog?